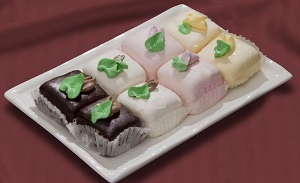 Petit Fours | Baker's Perfection, Inc.
White Square - Moist vanilla cake filled with chocolate ganache and dipped in white icing. Chocolate Square - Velvety chocolate cake filled with chocolate ganache and dipped in chocolate icing. Lemon Square - Moist vanilla cake filled with smooth lemon filling and dipped in yellow icing. Pink Square - Moist vanilla cake filled with pure raspberry preserves and dipped in pink icing.